“Still Alice” opens with a 50th birthday dinner in honor of Alice Howland, a brilliant linguistics professor at Columbia, given by her loving family. Everything seems picture-perfect for the successful, intelligent Howland family. Not long after the dinner, Alice begins to notice that all is not right with her. She goes to California to give a guest lecture and, inexplicably, forgets a key term. When she returns to New York, she goes jogging one day and forgets where she is. Concerned, Alice consults a neurologist. They find that she has early onset Alzheimer’s. Alice informs her husband, John (Alec Baldwin) and her three grown children, Anna, Tom, and Lydia. All are shocked and, at first struggle with the diagnosis. How could Alice, such an accomplished professional, have developed such a disease so early in life? “Still Alice” chronicles the progression of the Alzheimer’s in Alice. Alice was a great teacher, but has to admit her disease to her department chair and give up her career. She becomes distraught when she cannot find a bathroom in her seaside cottage, and has an accident. She does not sleep well, waking up John in the middle of the night looking for her phone. Alice becomes fearful and agitated. Little by little, she slips away from the world she knew and loved so much. An independent woman, she can no longer go out by herself. Julianne Moore gives a wonderful performance as Alice. In the opening scene, she is vigorous, attractive, and full of life, surrounded by her loving family. As the disease takes hold, Moore lets us in on Alice’s thoughts and emotions. Understandably, at first she cannot understand what is happening to her. She becomes frustrated and occasionally angry. In her best scene, Alice addresses a meeting of the Alzheimer’s Association, telling them what it’s like for her. Alice wants to do a good job with her talk, of course. She is anxious that she won’t get through it, but she gives a passionate talk to a supportive audience. However, she does well and receives a warm ovation. As the disease continues to take its toll, Alice’s look begins to change. She is less attentive to her appearance. She begins to look tired and worn down. The independent Alice now physically clings to John and her children, not wanting to be left alone. John, a doctor, considers taking a position at the Mayo Clinic in Minnesota. The thought of moving to an unfamiliar place, so far from home, terrifies Alice. She is unsettled by the slightest change, or thought of change, in her life. Alice is able to see her daughter, Anna, and her husband have a child. Anna cringes when Alice wants to hold the baby, but she lets her do so. Alice’s relationship with her youngest daughter, Lydia, is the most complex. Alice loves Lydia, but disagrees with her decision to bypass college and move to Los Angeles to pursue an acting career. Yet in the end, the two grow closer. Somehow Lydia seems to understand her mother better than her siblings. 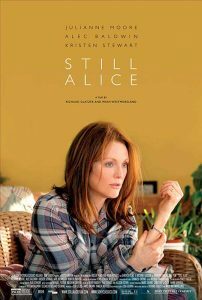 “Still Alice” is touching and sad, as we see Alice succumb more and more to Alzheimer’s at such a young age. The film is well done, with a good cast. Yet the movie belongs to Moore. I can’t imagine anyone else playing the part of Alice, and making her so real. Moore has won many awards for her performance, and just won a much-deserved Oscar for her work in this movie. As she does in her speech before the Alzheimer’s Society, Moore lets us see into the heart and soul of a person battling Alzheimer’s. These days, it’s hard to imagine anyone whose life has not been touched by this disease. I’m thankful for this movie which helps us to understand the humanity in those who suffer from it.